Fascinating new developments from the world of printed electronics, the technology’s possibilities in the healthcare sector, or experiencing the production process of NFC-powered LEDs: this is just a small excerpt from the diverse supporting program of LOPEC 2018. It is an integral part of the exhibition and complements the proven combination of exhibition and conference: with Panel Discussion, Demo Line, Award Show and much more. 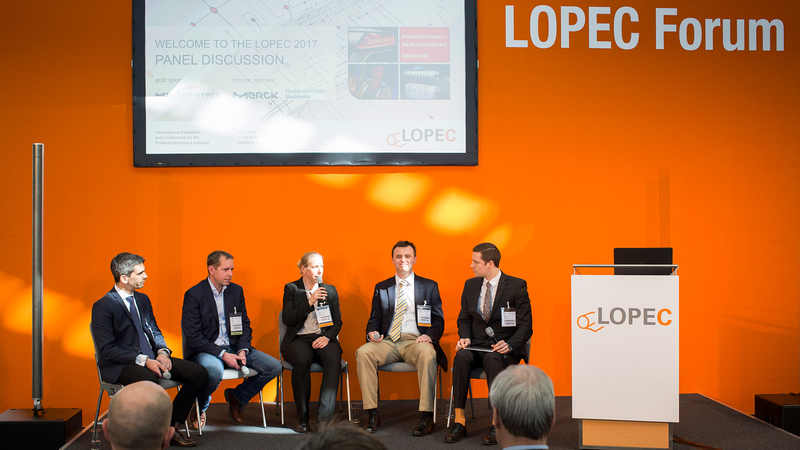 Countdown to the tenth edition of LOPEC: from March 13 to 15, 2018, the entire printed electronics industry will come together at the exhibition grounds in Munich, Germany. With more than 1,550 square meters of exhibition space, LOPEC will break its own last year’s record. At the same time, the LOPEC Conference will provide information about new developments and trends for this technology. The supporting program will make printed electronics tangible—in the truest sense of the word. CDT, Cambridge Display Technology Ltd., for instance, will demonstrate on the basis of a FlexOLED refrigerator door how printed electronics are conquering everyday life. With its printed, thin and flexible OLED displays, the company has created a special design freedom that allows for the technology to be used in numerous household appliances. The LG Signature OLED TV 65W7 is ready to move into households today. The display of the OLED TV is less than five millimeters thin. Visitors can convince themselves of its image quality at the Innovation Showcase. The interactive data glasses with bidirectional OLED microdisplays from Fraunhofer FEP (Institute for Organic Electronics, Electron Beam and Plasma Technology) are still a prototype. What is exceptional about them: The glasses enable simultaneous image recording and display. The use of printed electronics in cosmetics is still relatively new. The Changzhou Institute of Printed Electronics Industry (CZIPEI) has developed an eye mask that promises three benefits for the sensitive eye area through microcurrents: It is designed to smooth out wrinkles, prevent dark circles and minimize bags under the eyes. Visitors can experience these and other products as well as demonstrators at LOPEC Innovation Showcase. Visitors can see the entire production process of an NFC-powered LED at the LOPEC Demo Line. Near-field-communication (NFC) transfers energy from the smartphone to an object. In this case, on the occasion of the LOPEC anniversary, it is a birthday candle in the form of an LED, which is embedded in a greeting card. More than a dozen companies, members of the OE-A, are participating in the Demo Line 2018. 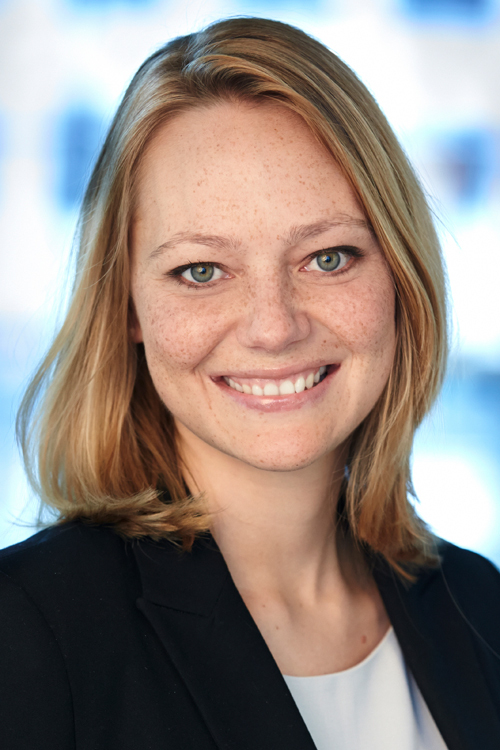 In keeping with the focus topic “Wellbeing”, the LOPEC Panel Discussion on March 14 (15:00, LOPEC Forum) will focus on the future of health care. Four experts from the world of IoT, wearables and research and development will discuss the role and market opportunities of printed electronics in healthcare and wellbeing applications. The panel will answer questions from the audience. The LOPEC Dinner will also take place on March 14. One of the highlights of the evening: the LOPEC Award Show. 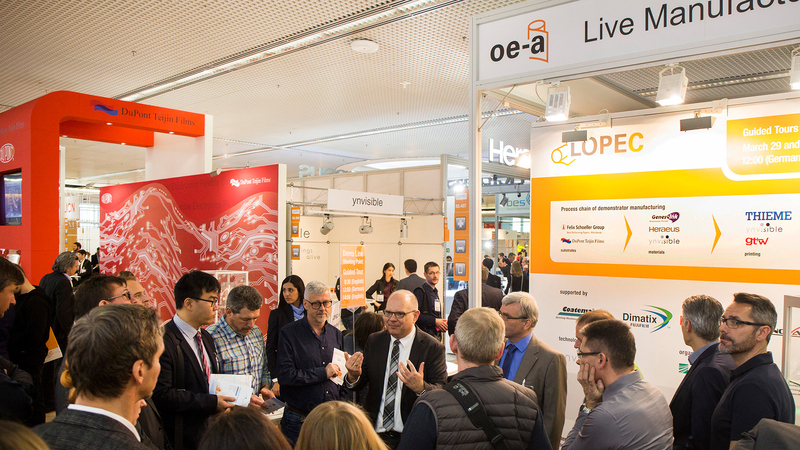 The OE-A (Organic and Printed Electronics Association), which organizes LOPEC together with Messe München, will award prizes to the winners of the OE-A Competition and the LOPEC Start-up Forum. The awards will be presented in five categories for the best ideas, prototypes and products in the field of printed electronics. With a wide range of topics, the supporting program offers the suitable choice for every taste and every need. In order to make sure you do not miss any event, please visit Twitter at @LOPECMunich to receive valuable tips in real time.